It is a sunny day, four days before the 30th anniversary of a major uprising across Venezuela that is known as the Caracazo. On that day, on February 27, 1989, thousands of poor Venezuelans stormed the city. Their frustrations had boiled over. Years of poverty and indignity had eaten into them. Then, without warning, the government raised the price of bus tickets. It was more than they could handle. Caracas burned, and then so did Venezuela’s other cities and towns. The police and army were sent onto the streets. They shot at the protesters. It was a bloodbath. Hugo Chavez was then in charge of the presidential guard. He was not at his post because he was unwell. When Chavez returned, he shared the mood of his fellow soldiers. They had been forced by the government of the oligarchy to shoot at their families and neighbors. It was something that they pledged never to do again. Chavez sensed the atmosphere of the poor of his country. They were ready to change the system. It was in the ashes of the Caracazo, 30 years ago, that Chavez and his comrades began the Bolivarian Revolution. It is what produced Mariela Machado and it is what she believes that she must defend. So, they built Kaikachi. It is a clean neighborhood of apartment buildings with a community center at one end. A bust of Chavez stands before the community center, where there is a bakery to provide good quality and low-price bread to the community, where there is a kitchen that feeds 400 people, where there is a community hall (with the obligatory mural of Che Guevara) where there is small room where women sew clothes in a self-help business. “We are Chavistas,” says a woman, her eyes shining, a child at her hip. The word “Chavista” has a resonance. It refers to those women and men who are loyal to Chavez and to the Bolivarian Revolution. It is not uncommon to see t-shirts with Chavez on them, his image ubiquitous on the walls. These are not people who have become rich or become powerful. They are part of a movement to chip away at hundreds of years of inequality. They remain poor, but now they have some resources to live without desperation. Hyper-inflation is depressing. But, the poor in places like Kaikachi benefit from subsidized flour for the bakery and subsidized food for the kitchen. The distribution of food is not perfect, but it saves people from the worst impact of the collapse of the oil prices and the U.S. sanctions. The day before I meet Mariela, I go to a rally at Santa Capilla on Urdaneta Avenue. It is a rally organized by the Chavistas of Caracas to demonstrate their opposition to the threats of war from the United States. These are women and men who have the marks of hard work and poverty on their bodies. They huddle to each other, homemade signs with the faces of Chavez and Venezuela’s President Nicolas Maduro, with enthusiasm. One sign held by an elderly couple is very moving: We are the Invisible. We are the Invincible. We will overcome. So much needs to be changed, says Mariela. We are poor. We have no resources. We have bad habits. We need time to develop our revolution. “Our revolution has to be done. It has to happen. It is in process.” A man nearby tells me that socialism is not a utopia. It is a difficult journey. The Chavistas mobilize almost weekly. They are on the streets to reaffirm their commitment to defend this difficult process. In front of Kaikachi is a middle-class apartment building. Sometimes, Mariela says, people from that building throw trash and bottles into Kaikachi. “They want us to be evicted,” she says. If the Bolivarian government falls, Mariela points out, a government of the oligarchy will take the side of those residents. They will revoke any title that the 92 families have to the land. They will hand it over to a landlord, who will raise the rents and squeeze the poor. Right now, Mariela says, Venezuela faces an economic war from the United States and its allies. If the government in Caracas falls, she says, Kaikachi will face its own embargo from the government of the oligarchy, from the middle-class neighbors and—most of all—from the landlords. Their dreams of a better life will end. Hey Buddy!, I found this information for you: "Notes from the streets of Venezuela — the people are resilient in the face of foreign intervention". 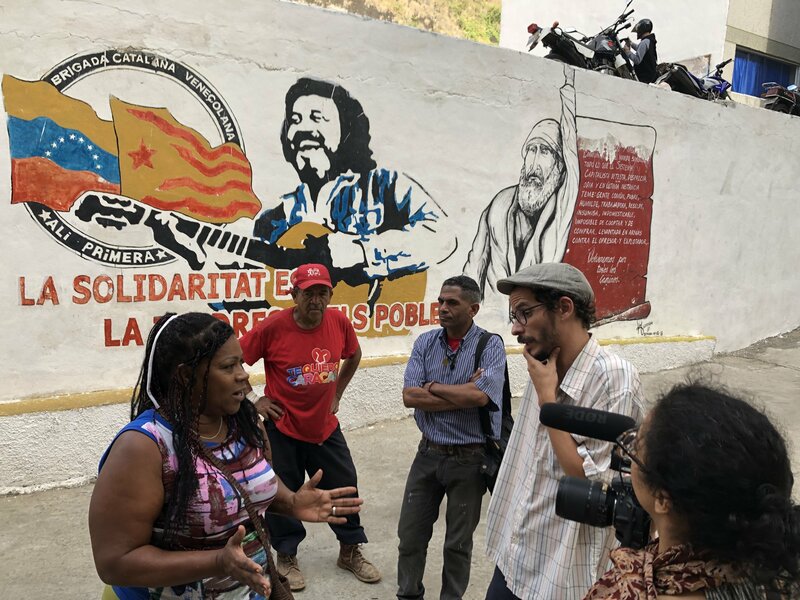 Here is the website link: https://peoplesdispatch.org/2019/02/27/notes-from-the-streets-of-venezuela-the-people-are-resilient-in-the-face-of-foreign-intervention/. Thank you.